There [Florida], 52 counties tallied their votes using paper ballots that were then optically scanned by machines produced by Diebold, Sequoia, or Election Systems and Software. 29 of those Florida counties had large Democratic majorities among registered voters (as high a ratio as Liberty County— Bristol, Florida and environs— where it’s 88 percent Democrats, 8 percent Republicans) but produced landslides for President Bush. On Countdown, we cited the five biggest surprises (Liberty ended Bush: 1,927; Kerry: 1,070), but did not mention the other 24. Now putting on my conspiracy-theory hat: if you are going to steal an election by submitting a few extra votes (or 93,000 extra votes for that matter), what better way than to do so in a county that the opponent wins easily anyway! The state relies heavily on punch-card balloting machines of the hanging-chad variety. Voting machines in Ohio failed to register votes for president in 92,000 cases over all this year, a number that includes failure to cast a vote, disallowed double votes and possible counting errors. An electronic voting machine added 3,893 votes to President Bush's tally in a suburban Columbus precinct that has only 800 voters. Anyone who has ever worked with computers know that for every problem you actually discover, chances are there are more lurking in the background that you never notice. However, those problems can still have an impact on the final result. There is also a maxim in computer science: there is no such thing as a bugfree computer program. BlackBoxVoting.org are working on putting together a Freedom of Information Act review of the election. It is a massive project. The main issue facing a divided America is not the economy, the environment, social issues, or the war in Iraq. It is how we elect our representatives, be it president, senator, representative, or even the city council. In a winner take all system that we have, there is no room for special topic parties. Therefore, the Republicans and Democrats both have to pander to special interests. In the election aftermath there was a lot of talk about by the media about what the democratic party has to do to win. How to recapture the south and rural voters? How to do that and not lose it loyal base of liberals. It is not right. This is a big country - we even have three national anthems - surely there is room for more than two political parties. Then the rural and southern masses that are educated in more by their clergy than by academics (hmm, why does that sound familiar?) could vote for a party called the Southern Democratic Christian Party, perhaps headed by Zell Miller. The gun-toting NRA-following animal-killing rightwing could vote for a party called the 2nd Amendment Party. Etc. These parties would likely pull votes away from the Republicans and Democrats. However, in a winner-take-all system no one would vote for these parties. Both the Green and Libertarian parties are legitimate political parties, but very few people vote for them. Why? Because nobody supports their views? I don't think so. It is because in a winner-take-all system voting for these parties is tantamount to throwing away your vote. So you hope that your major party candidate can be all-to-everyone and be elected and still give priority to your hot button issue, while remember that he pandered to those that think $2/gal gasoline is a problem and not a solution. True electoral reform would require that those who vote for smaller parties receive a representation equivalent to their popular appeal. Thus, if the Green party were to obtain 10% of the vote, they should have 10% of congress. If the Southern Democratic Christian Party received 15%, they should have 15% of congress. Etc. Otherwise you will have to morph the Democrats and Republicans even closer together. The Democrats will have to become pro-life, anti-gun-control, gay bashing, etc. Because it is those hot=button issues that decide elections these days more than the economy, security, the environment, Iraq. And when the Democrats and Republicans have so come together we could just elect our leaders in the same fashion as student governments are elected around the country - who is beter looking, who is more athletic, who has the richer friends. After all, that seems to be as important. Sorry about the rant - but I feel pretty disenfranchised right now. 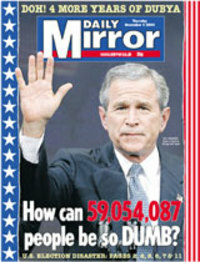 November 2, 2004. 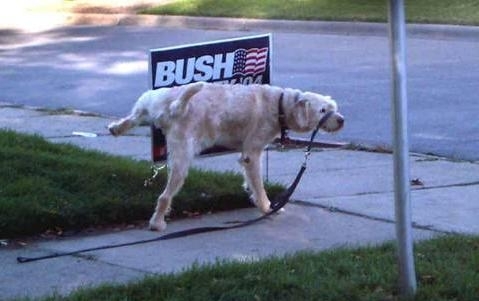 With the presence of representatives from Sweden’s Moderata Samlingspartiet (the conservative party) here in Austin proselytizing for Bush, I have decided to extend my policy of not voting for anyone who might have supported Bush to the Swedish elections. Therefore, I pledge that I will vote in the next Swedish elections, and – here is a surprise for Jonas – I will not vote for Moderaterna (especially after having had Messrs Hedberg and Nyman here polluting the air in Austin with their right-wing breath. I have been exploring the various Swedish political parties and ran across a very interesting item on Miljöpartiet’s web site – Friår. Friår – roughly, sabbatical year – is a concept in which an employed person can apply for a sabbatical for 3 to 12 months. During that sabbatical, the employee is paid 85% of what he or she would receive as unemployment compensation paid from unemployment insurance. In the meantime someone from the unemployment rolls is given the job of as a substitute – I suppose at a wage commensurate with that person’s skill level and experience. Everyone wins! The unemployment insurance pays 15% less. The unemployed person gets a chance at a job where he or she may gain skills and have an inroad to the job market. And the employed person has an opportunity for a sabbatical which can be used to relax, learn a new skill, start a business, or whatever. Something for the Texas Work Force Commission to consider? … forget about it, it makes too much good sense. It turns out that both I and the Daily Mirror owe Mike (aka Elf) an apology. Of course it should have been "How can 59,054,086 people be so DUMB?" Speaking for myself, I don't consider Mike a dumb bible-thumping, gay bashing, warmongering, gun-toting hick. The problem is, if he ain't, what's the appeal. Perhaps it is I who am too dumb to get it? Always a possibility. Sorry John, I am not in that mood. Frankly it is a sad state of affairs when it is necessary for a country this large to find common ground all the time. I don't want to play that game. I have nothing in common with the bible thumpers and the gun toters. It is a problem with American electoral politics that there is no room for special interest parties. I would have preferred voting for the Green Party, if that wouldn't have been totally fruitless. Some of the bible thumpers might find more comfort in a Chrisitian Democratic Party as are found in most major European democracies. And the gun nuts might enjoy supporting some right-wing party reserved for people who enjoy packing a small arsenal. A country as large as ours - big enough for three national anthems - should have room for more than just two parties. Especially when the post-election spin is all about how the Democratic party must find a way to recapture the south and rural voters but then risk losing its base on the left. Sorry, John, I am not going to support the effort of coming together. It is contrary to what I believe in. Actually I don't think has much to do with being afraid. I think the people in New York and DC have much more to be afraid of and they went solidly for Kerry. Hate to sound arrogant, but I think it comes down to ignorance, stupidity and fundamentalism. People who are religious in their views, be it with respect to abortion, gay marriage, or gun ownership, are more comfortable with Bush. We live in a country where we are told to be tolerant of others religious views. This has allowed the American madrases to run amok. Now we have a populace that believe that their ignorant misguided views on "social issues" are more important than health care, the economy, the environment, our standing in the world. They have no counter balancing understanding for science, geopolitics, or econmics. Furthermore, they are also so indoctrinated in a sort of 21st century manifest destiny that they don't comprehend that an Iraqi life has the same value as an American life. Also with Bush they are allowed to ignore what is so plainly obvious to anyone who actually has a non-flat EEG - that you can't continue to run up deficits (which is a concept they can't comprehend anyway), that you can't continue to ruin the environment, that you can't consume fossil fuels like it is an endless resource, that you can't continue to piss off the rest of the world. This is very much reflected in the county-by-county differences that P___ observed. I think it is time to put religious tolerance aside and not accept ignorant false teachings from churches. It is time for a bright world (http://www.the-brights.net/). Fact of the matter, I don't think it comes down to what people actually believe, whether it is fear or "social issues". I think practicalities like having voting on a Tuesday (when it makes no difference to retirees (read Bush supporters), but is a royal pain for young people. According to one commentator (Olle Wästberg - I am not sure of his source, but I trust it is accurate) only 17 per cent of young people voted. 17 per cent. What if that is true in Ohio and an additional 45 percent of young people had voted? Is it because of apathy or because it is tough to stand in line for hours in the rain when you have been at work all day, are tired, and hungry and perhaps have children at home to feed? What's up with that. Is early voting not available in Ohio? Burnet County was 73% Bush, 26% Kerry, 1% Badnarik. Travis county (Austin, which is where I work) was 56% Kerry, 42% Bush, 2% Badnarik. I think that's why I was so hopeful - because of the community I work in. Anyway, people are afraid, and that plays right into Bush's policies. People are afraid of all those OTHERS out there. So we have to teach people not to be afraid by not being afraid ourselves. Yeah, I sound like some crusader, but we need to be. We can't say "on to 2008." We have to live it everyday between now and then. The truth is, today I have to get through the grief process. But tomorrow . . .
At 8:51 AM -0600 11/3/04, P___ wrote: I have been doing a county by county analysis. What sinks home is not that we lost... but how divided this country really is on race and religion. You have counties that swing from 60/40 Bush to 60/40 Kerry in just a few miles..
Atlanta was really divided between Fulton and the rest. Jeff's state Oregon seemed the same. There is no hope for Oklahoma and Alabama.... they are really the big red states... Louisiana is traditionally New Orleans vs. the rest of the state but ironically Baton Rouge elected its first black mayor and Point Coupee, a rural parish went for Kerry by last count. The catholics wee definitely influenced by the bishops and the so-called abortion issue. While I hope for the best... I do have a valid passport and might just sell my house. If you go to www.cnn.com, you get a good county by county breakdown. Where did your county come out? It's a dark day for America, a dark day for the Iraq, a dark day for the environment, a dark day for health care, a dark day for the safety and security of humankind, as the ignorant, stupid, hicks vote. Any one want to buy a house?